I chose a few photos representing Anna's joy, love of travel, and how Anna and I trekked across the world to mountains of Honduras, Uganda, and Dry Bones Denver. Parents want to say “my children” but they are not “ours.” Since Anna was a baby and refused to let us feed her with a spoon, she taught me this: Anna is not mine. She is God’s child. I told Anna when she was younger that someday her fierce independence and strong will would help her fend off boys who needed fending, and that turned out to be right. Anna is a strong person who doesn’t need to please you but has a path she’s following . 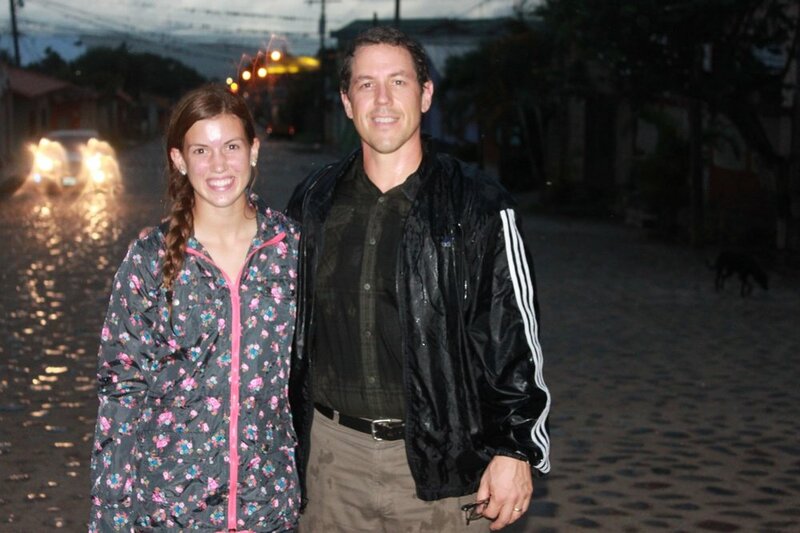 . . for example, unlike most 18 year olds, Anna already has a bucket list: skydiving, Honduras, mountains. She's done all these and more, and we did a few of these together. I couldn't believe it when she asked if she could skydive on her 18th birthday, and she wanted me to go. Gulp. Never skydived before. She jumped first out of the plane (we both were tandem), and she taught me the leadership secret. People will jump if you jump first. How could I stay in the plane now! My daughter was hurdling through the air toward the ground. I had to follow now! 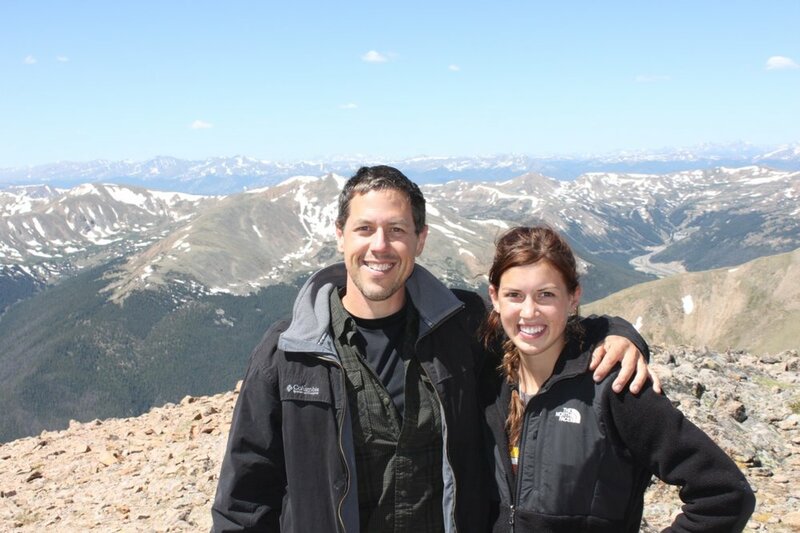 When Anna graduated from high school, I wanted our church to pray over her, to tell the church some things about this young lady who was about to set out from our home into the world, and her mother and I believed she was indeed ready for that. That day in our church Jill and I told our church family that Anna is a strong, smart, kind-hearted young woman who has for ten years remained faithful and loyal to Christ and His church and has stuck it out when youth group got difficult because many friends left our church, and things were not fun. Anna has served in the nursery when she’d rather be in worship or in youth group. She has served in camps, activities, both in school and here in our church without complaint, skillfully, and without need of recognition. She attends showers for people in their twenties she sort of knows from years ago in youth group but feels loyalty toward what it means to be a church and reciprocate our love for each other. Anna agreed to attend Perspectives class in the Spring semester of her senior year when a dozen of us from our church also attended. She wrote a paper about the Hmong people that ranged from describing the shooting in 2013 among the Hmongs that she helped to clean up after, to telling about the way she was praying for the Hmong people to evangelize their own by sending missionary support to Vietnam for Vietnamese Hmongs to enter China through the black market and evangelize in the name of Jesus. Jill and I requested our church who have been through a lot of what she’s been through in, stuck it out, to come pray with Jill and me, over our (God's) Anna. Our family has listed the qualities that we admire and appreciate in Anna, ways we see God at work in her life, and we want to share a few of those here, and these will be addressed to her directly. You are Loving. Just as God is love, so you are filled with love and compassion. We constantly see this love coming out in your friendships, your love for Jacob, Ashley, Mom and Dad, your friendships, and with your cousins, aunts and uncles, and grandparents. You are smart. You have shown this in many ways, always excelling in school and improving when needed to “beat Davis” in A.R. or trying extra hard to bring your grades up, which we’ve seen you do in 8th grade. This attention to detail and keeping yourself and room and our house organized is a quality that you inherit from your mother but have made your own and this serves all of us well and we all love how you keep things tidy and clean and organized and don’t take anything less as the standard, often cleaning up for people and going the extra mile. You have also been independent for as long as we can remember, and this is something that serves you well through life, because this independence shows you think on your own and are not afraid to strike out on adventures and try things. This is something that God has put in you as a gift, a readiness to say, “I can do it” and that spirit is so much better than what we hear some people say in today’s society that is just the opposite, such as “I can’t do it.” You always believe you can, and that’s a great quality. You are reserved, quiet, and calm. Those are qualities everyone appreciates. Sometimes people don’t always know what a quiet person is thinking, and that makes outgoing talkative people like Ashley or Jacob or Dad nervous, but people like Mom understand and know that quiet people like you are some of the smartest people. Ecclesiastes 5:3 says many words is the mark of foolishness, so you are definitely showing that you are wise by using few words. This is a great quality and we want you to see it this way. Being reserved and not always spouting your opinion is a good thing in this world of too many talkers and opinionated people. We like how you weigh your thoughts and words before saying something. You are very thoughtful. You have always enjoyed thinking about just the right gift to give someone, or you consider the feelings of people and are very aware of others feelings. You are daring, adventurous, courageous. You dare to take a risk and step out and try things. You are always willing to ride a ride that others are scared of, taste squid (for a price), or do something that takes courage. This daring is a sense of adventure, and your Mom and Dad see you traveling a lot in the future and daring to do things we have never even dreamed of doing. This courage is a gift from God and we believe if you continue to make wise choices, God’s favor and protection is on you as you do daring things to serve God and others in this world. You are Athletic. We love how tough you are on the field. You don’t ever give up and are willing to fight it out, whether in soccer with girls or playing backyard football with boys in the neighborhood. We like this scrappy way you play, and it sort of reminds us of how your Mom and Dad play games--well, maybe when we were younger. From the time you were an infant, you have always been very observant, watching people. I remember seeing you from the first day you were born, looking at your eyes and how they looked around at your environment. This is a good quality you still have. You “see the world” and this will serve to help you through your life. You are perceptive. You are creative and we’ve noticed how easily you can write your thoughts or put together a project. It’s just the choices that sometimes trip you up. But when choices are made and you are set free, you are creative and put lots of care into making it the best it can possibly be. You are sly and sneaky, which has been a quality you’ve had from early years when you would get into things you weren’t supposed to. This is something that could serve you in the areas of private investigating or reporting. You see things others may not see, and you quietly go about getting evidence or what is necessary to the situation. Snazzy is a word that might describe how you dress and enjoy fashion, though you don’t over do it and have good taste. Acts of service are one of your main love languages. You do things for people, you don’t mind working hard, doing extra chores or working around the house. This is awesome and you keep your room clean and neat, and that helps the appearance of the whole house and the happiness of all of us and all who visit, like your friends who can enjoy a nice place to sit and talk. You are a doer and not a talker. Your proof is in what you do and not what you say. You believe in action and not just words. You listen well and do what you are told, even if you don’t want to at first.